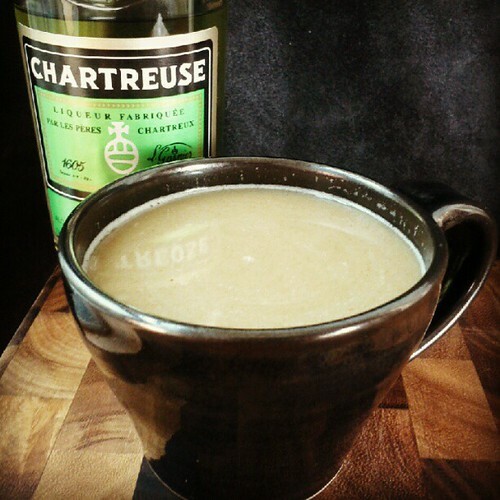 If Paula Deen opened a bartending school in the French mountains, the result might be something like this: Hot Buttered Chartreuse. Decadent? Yes. Worth it? Absolutely. A few years ago my friend Lance Mayhew introduced me to Hot Buttered Rum, which is exactly what it sounds like. Take rum, add butter, sugar, and spices, mix it with hot water, and you have Hot Buttered Rum. Butter is not a typical cocktail ingredient but don’t be put off by it. Melting butter into a steaming hot drink makes it rich and delicious. There are countless recipes for Hot Buttered Rum batter and you can buy it pre-mixed in stores, but it’s so easy to make at home that there is no reason to do that. Lance’s “World’s Best Hot Buttered Rum Recipe” lives up to the name and I’ve enjoyed it every year since moving to Portland. Go over to Lance’s site and make a batch. – Use a quality rum. I like one with some age on it. I’ll be using Bacardi 8 this Thanksgiving, I don’t think there is a better rum for a Hot Buttered Rum. – Use cheap rum. Cheap rum is going to taste even cheaper when you warm it up. You can’t hide poor quality ingredients in this drink. 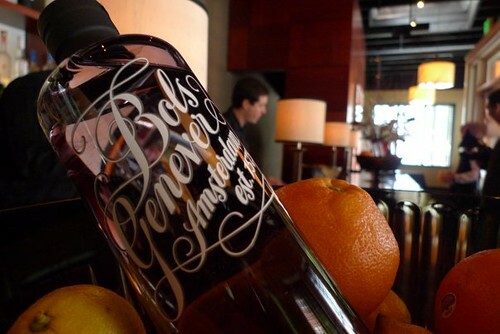 If it’s important to use good spirits, why not go all out and use one of the best spirits in the world? Why not use Chartreuse? Though I’ve mixed Chartreuse in hot chocolate many times, I had no idea if this would be a hot mess or a mug of pure awesomeness. The concept was so tantalizing — Hot. Buttered. Chartreuse. — that I needed to try it out. And after a long shift, I did. Happily, the drink is every bit as good as it sounds. Add the batter and some of the hot water to a mug, stirring to dissolve. Then add the Chartreuse and top off with more hot water, giving everything one final stir to combine. Now, about that dollop. This is no time for moderation. You left moderation behind the moment you decided to drink butter and Chartreuse. Compensate later if you have to, but get the most of out of this experience and don’t hold back on the batter. About the mug: Be sure to pre-heat it. The mug, the batter, and the spirit are going to lower the temperature of the water. The drink is Hot Buttered Chartreuse, not Tepid Buttered Chartreuse. A mug pre-heated with hot water will keep your drink warmer longer. Sharing a couple mugs of this with someone you care about it is a great way to warm up on a cold winter night. For Wendy, who includes a smokejumper clause in all her relationships. Shake with ice, strain into ice-filled rocks glass. * Equal parts brewed lapsang souchong tea and sugar. Or if you’re feeling spendy, substitute Qi black tea liqueur and a bit of sugar. I was recently hired by Big Bottom, a new independent whiskey bottler and soon-to-be distiller based outside of Portland, Oregon, to come up with a few cocktails for their debut product. Their first is a nice 3-year old Indiana bourbon with a high percentage of rye in the mash bill. The second is a 2-year bourbon finished in tawny port casks, a unique whiskey that will be available soon. Stir with ice and serve up. Build in a mug and top with whipped cream if you’re feeling decadent. Good beer, it can be pretty easily argued, is perfect and complete by itself. 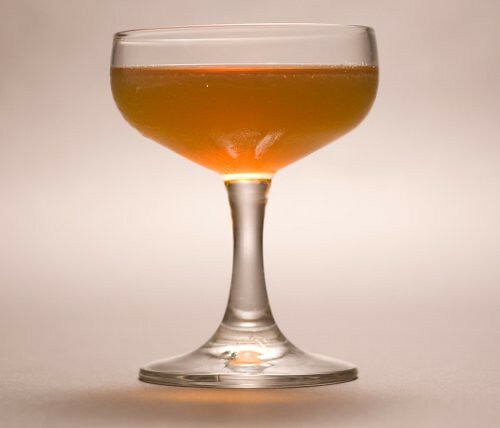 It’s complex and flavorful and doesn’t need anything else … except that a band of intrepid young mixologists see good beer as a starting point for something better — beer cocktails. Straight-ahead beer fan that I am, I have to agree that beer cocktails open up a brave new world. I recently got to taste and talk about beer cocktails with some of Portland’s most ardent proponents: mixologist Jacob Grier, New School blogger Ezra Johnson-Greenough and Yetta Vorobik, owner of the Hop & Vine, where Grier and Johnson-Greenough held an event in the summer called Brewing Up Cocktails. They plan to repeat it this month, also at the Hop & Vine. 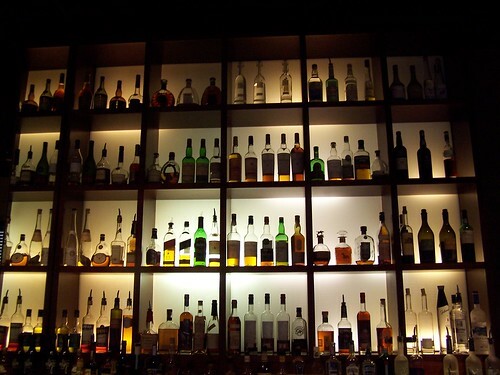 Portland bartenders Jabriel Donohue, Neil Kopplin, Christian Rouillier, and Kevin Ludwig also make appearances. Read the whole thing here. The drink in the photo is the Quatro Blanco, made with a Farigoule rinse, Herradura reposado tequila, and a special keg of Upright Four wheat farmhouse ale aged in a Hungarian oak barrel with yarrow flowers and rose petals. It was probably my favorite drink from our Brewing Up Cocktails event, but since it was a one-off beer it will probably never be made again and you will never be able to try one. The name comes from the beer, because Yetis are furry, and from “bur” as in bourbon. So Furburger. See, nothing dirty about it. At least that’s what I thought when a friend jokingly suggested the name assuming I knew what I meant. I didn’t know what it meant and so passed the idea on to the owner of Hop and Vine. It wasn’t until two days later that I learned what it really referred to. We talked about finding a new name for the drink, but after that incident we couldn’t think of it as anything but a Furburger. The lesson? When coming up with new cocktail names, be sure to look them up on Urban Dictionary before submitting them to your prospective boss. Or not: The Furburger was one of our bestsellers of the day. And since the word has been approved for use in schools by a federal judge, why not for a beer cocktail menu too? Two other cocktails from the event, the Dutch Devil and Brewer’s Bramble, we’re covered previously here. Brewing Up Cocktails II is in the works and we’ll announce the date soon; stay tuned here and at The New School Blog. When you see green in a mixed drink, that’s often a sign that the bartender is getting carried away with sour apple pucker and it’s time for you to find another bar. Not so if the color comes from Chartreuse liqueur. 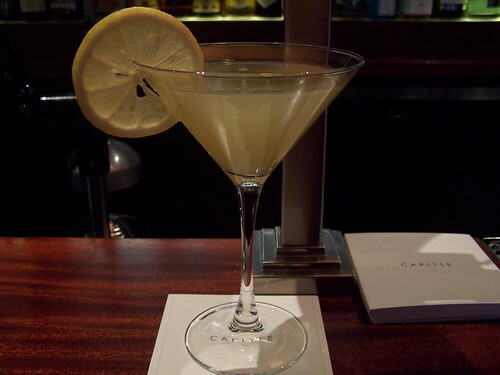 My post today at Crispy on the Outside takes a look at the delightful Last Word cocktail.